Whether you’re setting out for a day hike through the woods or attempting a moderate mountain summit, you need a backpack to carry your essentials. Water, extra layers, snacks, and a camera are among just a few of the items you might want to bring along. Patagonia’s new line of Nine Trails packs offers six different options for outdoor enthusiasts — all you need to do is choose your adventure. The Nine Trails line is designed for hikers, cyclists, and lightweight overnight backpackers looking for an efficient means to carry their gear. The daypacks range in size from 14-36 liters and include two female-specific builds. Patagonia didn’t skimp on necessities but streamlined the design to be minimalist — similar to its snow-sport and climbing specific packs. The Nine Trails line boasts side compression straps, hip belts, and a well-engineered back panel system that maximizes airflow without compromising load capacity. The back panel has been stripped down for efficiency and comprises three layers: a frame sheet for structure and stability, perforated foam pads for comfort, and thermo-moldable mesh to create dead air space for ventilation. The 14L option is geared for cyclists, featuring a 2L HydraPak reservoir and plenty of space to organize layers, tools, and snacks. The large main compartment features a front tool pocket, and exterior stretch pockets allow you to store easily accessible items. The entire line features lightweight Cordura fabric that has been DWR treated for water resistance. 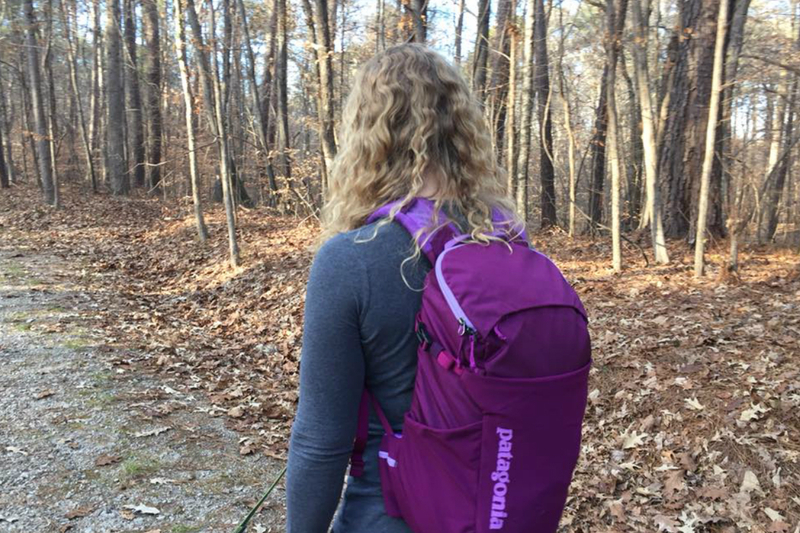 The women’s specific 18L and men’s specific 20L packs are ideal for day hikes when you need just enough room for the essentials. These packs feature a U-shaped lid that allows for access to the main compartment and stash pockets for smaller items in addition to exterior stretch pockets. Side compression straps manage the load while the padded shoulder harness with adjustable sternum strap and waist belt helps you find the perfect fit. The women’s specific 26L and men’s specific 28L packs are designed for a full day in the mountains while the 36L is ideal for minimalist-style overnight expeditions. The 36L pack boasts a classic top-loading design with an integrated lid for easier packing and unpacking. Wherever the trail may lead you, Patagonia’s new line of Nine Trails packs can help you get there. The Nine Trails 14L retails for $140, the 18L and 20L retail for $130, the 26L and 28L retail for $160, and the 36L retails for $200. The entire Nine Trails line can be purchased on Patagonia’s website.